I can’t believe how successful our petition to make the gillnet ban permanent and our social media Thunderclap campaign have become in such a short amount of time! We started these campaigns about a month ago, and could have never predicted the sheer number of people that would support them. In other news, PROFEPA and Sea Shepherd have been making tremendous progress in ban enforcement and net confiscation. Despite inclement weather, dozens of Totoaba nets have been retrieved from the water, and multiple poacher arrests have been made in recent weeks. It is wonderful to see the Mexican government working closely with NGOs to accomplish a mutually desired goal! If you haven’t already, please sign our petition and Thunderclap! Thank you. 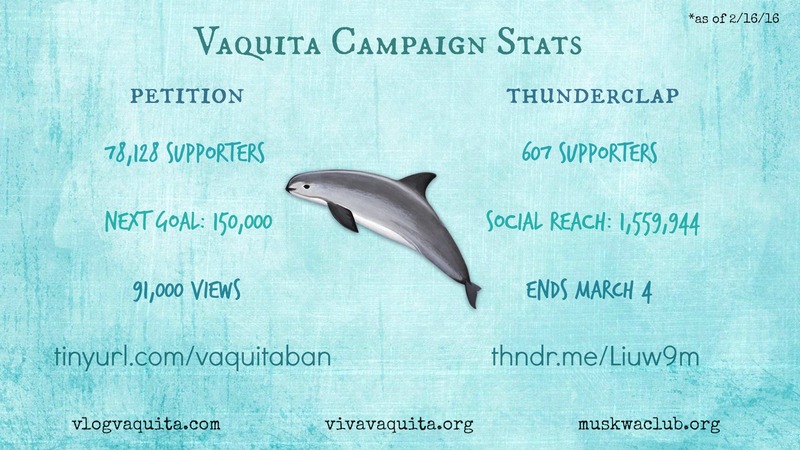 “The last couple of months have seen a great deal of activity in the world of Vaquita conservation. While the gillnet ban went into effect in the spring of 2015, media reports suggested that it was not being enforced effectively (and we heard of several busts of illegal fishing activity). At the end of September, the Ocean Starr (formerly the NOAA vessel David Starr Jordan) began its two-month long survey of the Vaquita population, designed to develop a new estimate of abundance. At the halfway point in late October, the news was mixed. Vaquita sightings were much lower than during similar periods of past surveys, prompting fears that the population size may already be critically low… but, Vaquitas were being sighted. Also, there was virtually no evidence of illegal gillnet fishing, suggesting that the gillnet ban is having an effect. A highlight occurred when, early in the cruise, several high-ranking Mexican government officials were able to see Vaquitas with their own eyes during a short stint onboard the Ocean Starr. It is hoped that this will help foster their appreciation and desire to protect the species. ¡VIVA Vaquita! crew members spent more than a week onboard the Maria Cleofas, a vessel dedicated to efforts to photograph and video-document the Vaquita, and to act as a media platform. Although several Vaquita groups were observed (some confirmed and some highly probable), we were not able to obtain any photos or video of the elusive animals. However, some images were obtained later by one of the Ocean Starr observers, Todd Pusser (see link above)! Media attention has been greater than ever recently, with several TV and newspaper stories coming out, and a number of film crews spending various periods of time in the area to document the activities. Most notable among these are a documentary in preparation by Wild Lens, Inc., a wildlife media company, and a planned story on the Vaquita for CBS News’ 60 Minutes, which is currently expected to air some time in December! Dr. Omar Vidal, Director of World Wildlife Fund Mexico, presented issues confronting Vaquita conservation to about 2,000 people at the Wildlife Conservation Network Expo in San Francisco in October 2015. And at the upcoming international marine mammal conference in San Francisco in December, ¡VIVA Vaquita! will be having a booth to raise awareness about the Vaquita and its plight and to promote conservation efforts. It is hoped that these various events will keep attention on the Vaquita and will help to ensure that the Mexican government does not let up on its efforts to save this species at the eleventh hour! Recent news also reports that the demand for Totoaba swim bladders (so-called, fish maws) remains high and now most buyers in Hong Kong and China are collecting them as investments, hoping that the price will go up as the fish becomes rarer and approaches closer to extinction. Drug cartels continue to be involved in the smuggling of this protected fish. All this is very bad news for the Vaquita, and it seems that the long-term prospects for the Vaquita’s survival will depend on finding a workable solution to this intractable problem. Also, please check out the official report of the first leg of the hugely successful 2015 International Vaquita Expedition (which will end in early December), as well as NOAA’s full collection of field reports and some really neat iPhone and GoPro videos from the expedition. With all that said, now is the best time to start preparing for every Vaquita activist’s favorite day of the year: International Save the Vaquita Day! #ISTVD2016 will be on Saturday, July 9 (ISTVD is always the second Saturday of July). Stay tuned to V-log during the upcoming months for new information on ISTVD 2016, and if you would like to be a part of this immensely popular and expanding event leave a comment or email me at <gl.tamarin123@gmail.com>. Thanks to Romanian graphic artist Tudosoiu Dragos for once again creating an awesome ISTVD logo! If you need a logo or graphic design of any kind, please visit his website at www.tudosoiu.ro. On October 22, two Vaquitas were photographed at close range, marking the first good photographs of the 2015 Vaquita Expedition, and some of the best ever of the species, for that matter! Everyone is extremely excited about this sighting (and the approximately 25 other Vaquitas seen so far during this expedition! ), as well as relieved to have new photos for future conservation efforts. President Enrique Peña Nieto is one of these excited individuals! He tweeted reports and photos of the sightings, and also stated that the efforts to save this species rage on, detailing the extensive recovery plan once again in a press release today! The U.S. government has also announced their partnership with Mexico and both of their commitments to saving the Vaquita and eliminating the illegal Totoaba trade in China. Weather conditions during the expedition have been favorable for the most part (despite the devastating Hurricane Patricia that hit much further south in Mexico), allowing for many sightings, including many of female (cow) Vaquitas with their calves that were presumably born this spring. This is tremendous news, as it means that Vaquitas are still finding ways to reproduce, and therefore can recover if the population isn’t being threatened by gillnets. This expedition has only been going on for a month, and it has already resulted in over 25 sightings, great photographs, and best of all, a renewed hope among the conservation community that the Vaquita can not only be saved, but that all the pieces are already in place to make it actually happen.